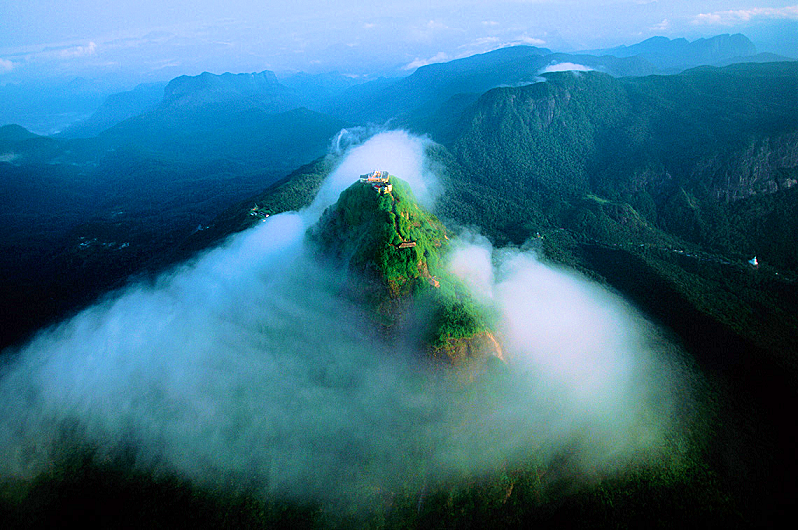 Adam's Peak also known as Samanalakanda (butterfly mountain), and Sivanolipatha Mala is a 2,243 meters (7,359 ft) tall conical mountain located in central Sri Lanka. These days the pilgrimage season begins on poya day in December and runs until Vesak festival in May. The busiest period is January and February. At other times the temple on the summit is unused, and between May and October the peak is obscured by clouds for much of the time. During the pilgrimage season a steady stream of pilgrims (and the odd tourist) makes the climb up the countless steps to the top. They leave from the small settlement of Dalhousie (del-house), 33km by road southwest of the tea town of Hatton, which is on the Colombo-Kandy-Nuwara Eliya railway and road. The route is illuminated in season by a string of lights, which look very pretty as they snake up the mountainside. Out of season you can still do the walk; you'll just need a torch. Many pilgrims prefer to make the longer, much more tiring - but equally well-marked and lit - seven-hour climb from Ratnapura via the Carney Estate, because of the greater merit thus gained.